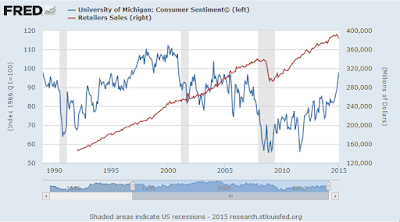 The University of Michigan consumer sentiment numbers came out today. Sentiment is down again this month, albeit slightly. Yet, confidence remains at a lofty level. Economists claim high sentiment numbers are good news for retail spending. Economists also claim the high confidence numbers is a reflection on the overall health of the domestic economy. Let's take a look at that theory starting with the Bloomberg Consensus Estimate of the University of Michigan sentiment numbers. Consumer sentiment is little changed so far this month, at 92.9 for the mid-month August reading vs 93.1 for final July. An early indication on August's consumer sector comes with the current conditions component which is nearly unchanged, at 107.1 vs July's 107.2. 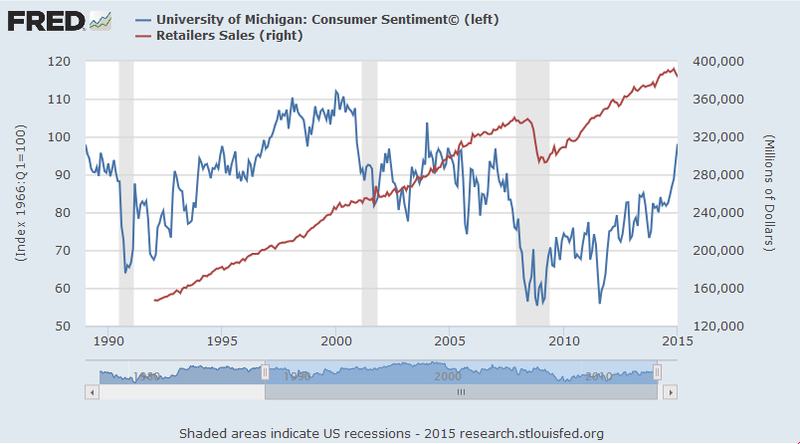 This hints at steady strength for consumer spending this month. The expectations component, which offers indications on the employment outlook, slipped 3 tenths to a still solid 83.8. Inflation readings are also little changed and have yet to reflect the ongoing price collapse for oil, at 2.8 percent for 1-year expectations, which is unchanged, and 2.7 percent for 5-year expectations which is down 1 tenth. Consumer confidence readings are down from their highs earlier in the year but are still very solid and a reminder that unemployment is low and that the domestic economy is healthy. Having taken a look at what economists claim, let's investigate the accuracy of those claims. Sentiment has a tendency to rise due to population growth. So instead, let's focus on year-over-year changes in sentiment vs. year-over-year sales growth. The idea that spending follows consumer sentiment is proven silliness. The idea that confidence readings are a sign of a healthy economy are as ridiculous, if not even more ridiculous.